I remember Topher telling me he was going to make “bulletproof coffee” for breakfast a few months ago. I was curious about this science experiment and really didn’t understand it. I needed to do some research to figure out why adding fat to coffee was becoming all the rage and if in fact there were benefits to a high fat breakfast. After some research, I thought maybe this is the way to supercharge your morning. Coffee is one of the best sources of polyphenols in the typical North American diet. Polyphenols are a specific type of antioxidants. Green tea (both loose leaf and matcha) is also a great source of polyphenols. MCT oil doesn’t require a carrier to get into the cell, therefore, it’s used directly for energy and not stored as fat! Everyone has their own interpretation of “bulletproof coffee”, we use MCT oil and coconut butter as our fats and we also add collagen, for protein. MCT oil stands for Medium Chain Triglycerides, the super cool thing about this is the fat from the oil goes directly into the cell, it doesn’t require a carrier, therefore, it’s used directly for energy and not stored as fat! MCT oil is extracted from coconut oil. 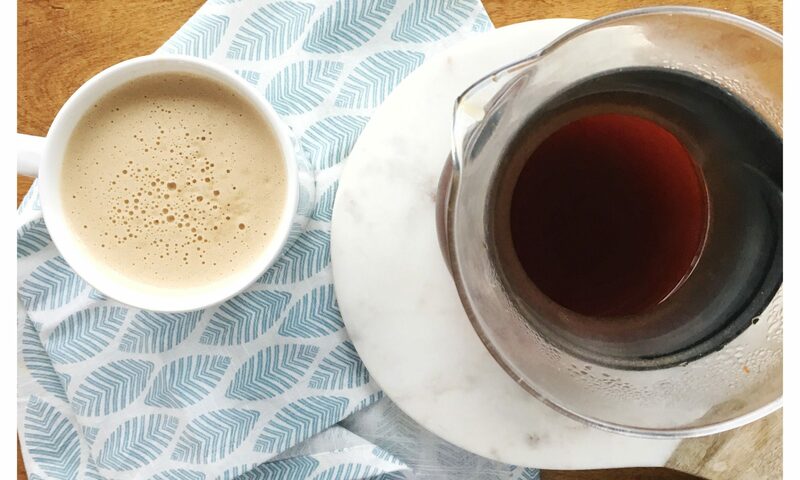 We add collagen to our bulletproof coffee for protein, I find and the research I’ve done, shows that for women especially, it’s important to layer your fat with some protein to prevent energy spikes or drops as well as the protein ensures you stay satiated all the way until your next meal (Lunch for us). Whenever you’re buying coffee, it’s important to choose organic beans. Coffee is one of the most sprayed and pesticide laden crops in the world, so if possible you want to avoid conventional beans. If you are unsure of whether your favourite coffee beans are organic, the barista at your local coffee shop should know or shoot the company a quick email asking, and they are usually happy to answer any questions! Combine all the ingredients in a blender, blend to combine until frothy! Pour into your favourite mug and sip your way to an amazing morning!